WVTV students will be video recording WVHS’ 2018 Commencement Ceremony on Sunday, May 27, at the NIU Convocation Center. The public can purchase DVDs of the event for $20 each. All proceeds from DVD sales will go toward WVTV for the purchase and repair of media equipment for students. 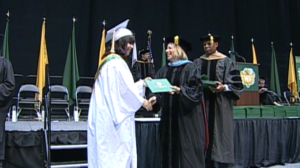 IPSD 204 Superintendent Dr. Karen Sullivan hands out diplomas at Waubonsie Valley’s 2016 Commencement Ceremony. The DVDs make a great gift or keepsake for graduates or family and friends who either are unable to attend the event or would like to relive the memory. Order DVDs by clicking here. Print and fill out the form, and follow the mailing instructions on the form. Customers may also purchase DVDs at one of several WVTV tables in the lobby of the NIU Convocation Center on Graduation Day on Sunday, May 27. Only cash or checks will be accepted. 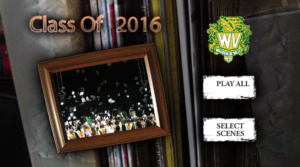 For more information on purchasing 2018 WVHS Graduation DVDs, call 630-375-3248 or e-mail wvtv@ipsd.org.